Airbrasive® Air/Oil Filters will filter the air in your work environment removing oil, water, and harmful contaminants. Our Air/Oil Filters are 99.9% efficient against sub-micron particles that will be in the air while you work. Combination filter specifically designed to remove moisture and oil. 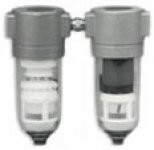 Our Compact Design Combination Filter has been specifically designed to remove moisture and oil.